Add intensity, protection and color to enhance visibility! 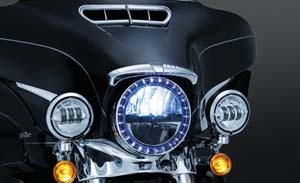 C3D-FG: Add a custom look to the front of your bike with this Headlight Bezel. 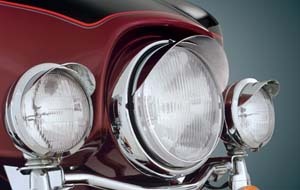 This new design is sculpted to perfectly fill the space around your headlight for a streamlined look. This bezel also features custom fang shaped bright white running lights to really make your bike stand apart from the rest. Easy installation includes everything you need to mount and plug into your accessory port with no cutting, drilling, or splicing. Custom light housing gives you a unique new look. 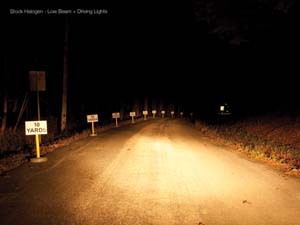 Bright white LEDs automatically turn on and off with your headlight. Removable light housing makes painting to color match easy. Trim Rings: Add incredible style with these easy-to-install grooved trim rings. Available in Chrome or Gloss Black. 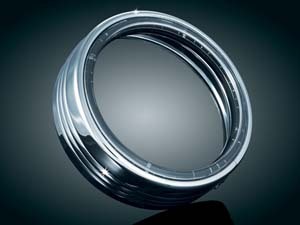 6915: Chrome headlight trim ring. Fits: '14-'15 Electra Glides, Street Glides & Tri Glide. 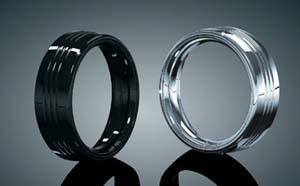 6916: Gloss black headlight trim ring. Fits: '14-'15 Electra Glides, Street Glides & Tri Glide. 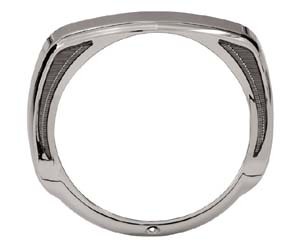 7275: Chrome headlight trim ring. Fits: 83-’13 Electra Glides, ’06-’13 Street Glides, ’94-’15 Road Kings, ’09-’13 Trikes & '12-'15 Dyna Switchbacks. 7276: Gloss black trim ring. Fits: 83-’13 Electra Glides, ’06-’13 Street Glides, ’94-’15 Road Kings, ’09-’13 Trikes & '12-'15 Dyna Switchbacks. 7277: Chrome passing light trim rings. Fits: ’83-’15 H-D Models with 4 1/2'' Passing Lamps. 6917: Our L.E.D. Halo Trim Rings add incredible style with their grooved trim, easy installation, & low draw on your electrical system. Night or day, this product is eye catching & adds much-needed style to your lights. Fits: '14-'15 Electra Glides, Street Glides & Tri Glide. 6918: Similar to 6917 but in gloss black. 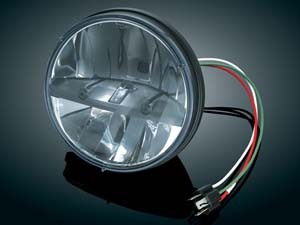 7785: Sure to be an eye-catcher, new 7" Headlight Trim Ring features a built-in L.E.D. halo. 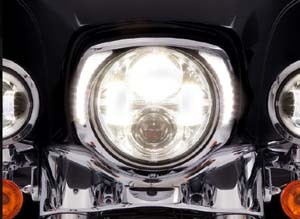 The array of white L.E.D.ís surrounding the headlight will get the attention of everyone else on the road, day or night. This super-clean trim ring looks great with a stock headlight or cutting edge L.E.D. headlight. 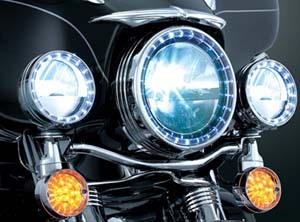 Fits: '83-’13 Electra Glides, ’06-’13 Street Glides, ’94-’15 Road Kings, ’09-’13 Trikes & '12-'15 Dyna Switchbacks. 7733: Similar to 7785 but in Gloss Black. 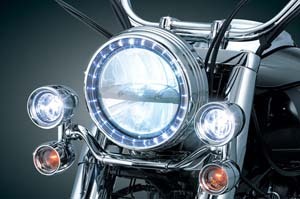 2249: 7" Headlamp. Complex Reflector design provides unmatched performance while providing the appearance of a traditional headlamp. 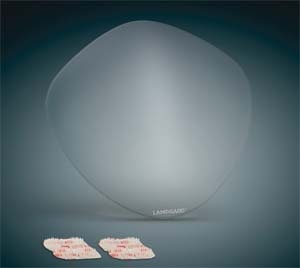 Passing lamp’s complex reflector complements the look of the headlamp. Impact resistant polycarbonate lenses with chemical & scratch resistant non-yellowing coating. 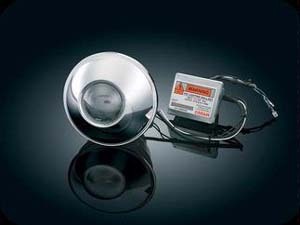 Low beam current draw 1.5 amps (stock halogen is 4.9 amps) High beam current draw 2.3 amps (stock halogen is 5.5 amps) Passing lamps (pr) current draw 1.4 amps stock halogen (pr) 4.0 amps. 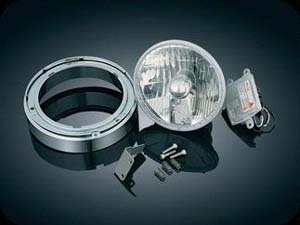 Meets applicable DOT, FMVSS or SAE requirements – 3-year warranty on headlamp & passing lamps. 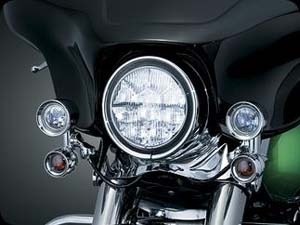 Fits: Electra Glides, Street Glides, Road Kings, Trikes, FLST Models with 7” Headlights & Dyna Switchback (ea). 2014 models require adapter HD-897 located on this page. Also fits Indian MY '14. 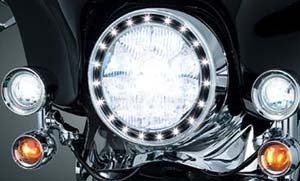 HD-897: Required for installation of LED headlamp on specific models. 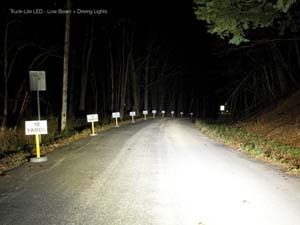 2261: This revolutionary new headlamp is the first to use advanced L.E.D. technology integrated into a one-piece stylish & functional headlamp! 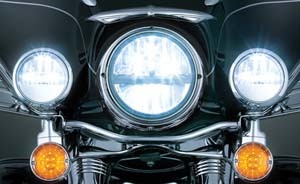 Add improved visibility at a fraction of the cost compared to HID or incandescent headlamps without adding heat or having to hide any excess wiring or electrical ballast! Mounts directly in place of the stock headlamp & the electrical plugs right into the stock headlight connector - Just simple hand tools & a few minutes is all it takes! Additional benefits include added reliability (50x longer than incandescent bulbs), energy efficiency (less power draw) & a stronger/wider beam for enhanced night riding. This L.E.D. 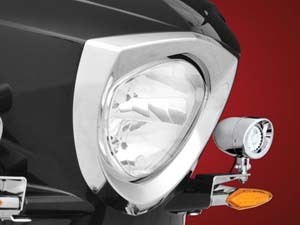 headlamp is simply the ultimate lighting accessory for your bike - Nothing else compares. Fits: 7” headlight housings with H4 headlamp plug. 2253: eGlideGoodies offers H.I.D. 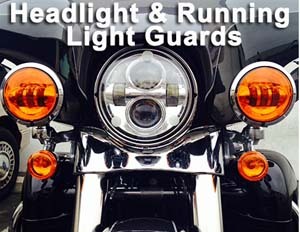 Lighting to H-D Touring Models. This design has an extension ring for the stock headlight housing to create enough room to house the H.I.D. lamp and ballast assembly. The extension ring is beautifully chrome plated and blends in so well you won't even know it didn't come from the factory. Installation is straight forward and easily done with common hand tools. 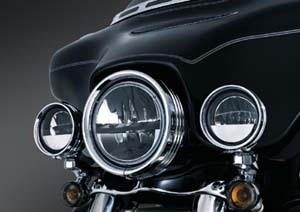 Fits: All '80-'10 Electra Glides, Street Glides, '94-'10 Road King, & '09-'10 Trikes. 2254: The 2254 Classic Chrome provides the ultimate in H.I.D. performance. This projector style lamp gives extraordinary performance in both low and high beam functions with an intense, yet very smooth beam pattern. Fits: '80-'08 FLHT Models (FLHT, FLHTC, FLHTCU, FLHX, etc.) & '94-'08 Road King Models. 2257: The 2257 Classic Chrome Tri-Bar model. The Tri-Bar ring can be removed easily for custom painting. Fits: '80-'08 FLHT Models (FLHT, FLHTC, FLHTCU, FLHX, etc.) & '94-'08 Road King Models. 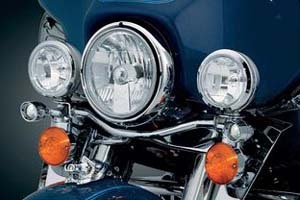 5494: Use these plug-&-play adapters to easily install LED or any '05 and later style passing lamps on an '04 and earlier H-D motorcycle equipped with spade terminal passing lamp connectors. Fits: allows installation of '05 to '12 style passing lamp on '04 and earlier H-D motorcycles. 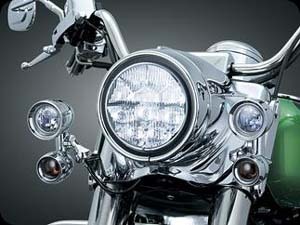 Armor: These guards protect your headlight from costly damage. They're designed to take the impact of every day road hazards that often crack or break a lens with out warning. With the cost of a new head light being hundreds of dollars and more we've always considered it pretty inexpensive insurance. All guards are secured by 3M Dual Lock's that separate the headlight from the guard allowing for easy removal when cleaning is needed. 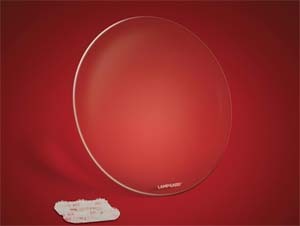 Manufactured from .150 Aircraft Grade Acrylic. 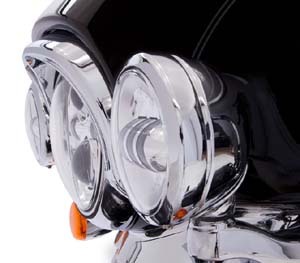 (7” round headlights with a shallow curve, used on: 1960-2015 Harleys) Special Order item. HL-V: Triangular headlight armor for Victory headlights for 2005 to current. Not vision. Made in USA. Clear Headlight & Amber Running Lights!